Long live the Pastry Queen! 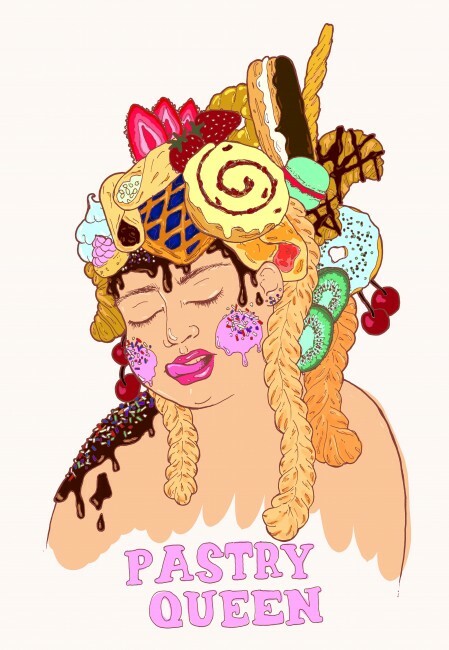 A digitally coloured illustration of a fat girl with pastry for hair and dripping icing for cheeks as she licks her top lip. Because she is the Pastry Queen! I’ve wanted to get a pastry related tattoo for a while now, and since I’m well into this whole cravings project I figured it’d be a grand time to kill these two birds with one stone. AND THUS: Pastry Queen was born! It’s not the first time I’ve played with hair-that-is-not-hair-but-in-fact-other-things, and maybe that’s a theme for me. Hair can be a fun and ridiculous way to express yourself, especially because it’s so malleable. For a lot of people hair is central to their identity too. Right now, I’m having a kind of hair crisis as I grow it out so perhaps I fixate on hair drawings in these moments! 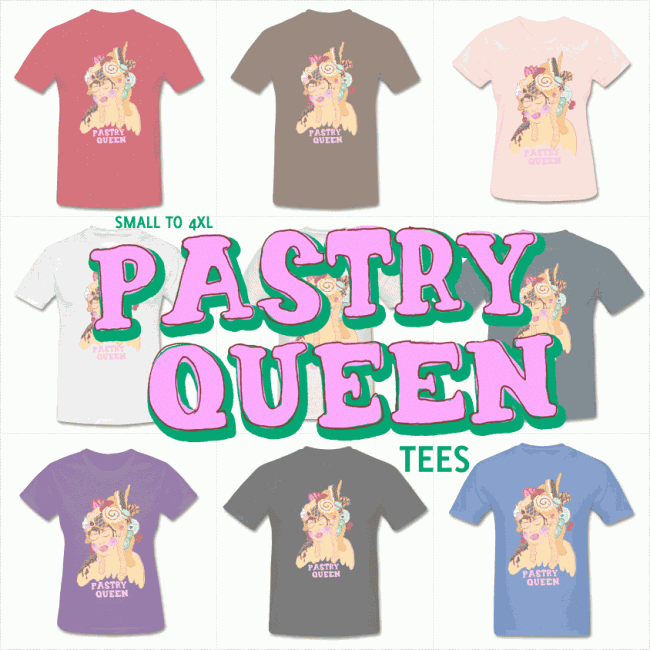 Image - a graphic of tshirts with my Pastry Queen illustration on the front and the text “Small to 4xl Pastry Queen tees”. I’ve put this design on some t-shirts on Spreadshirt if you’re interested in letting the Pastry Queen reside on your chest. I’ve only just started my Spreadshirt shop, after being with RedBubble for so many years, and I’m finding it much easier and cheaper, with a bigger size range and better shirts too (I love Gildan shirts). Buy a Pastry Queen t-shirt! 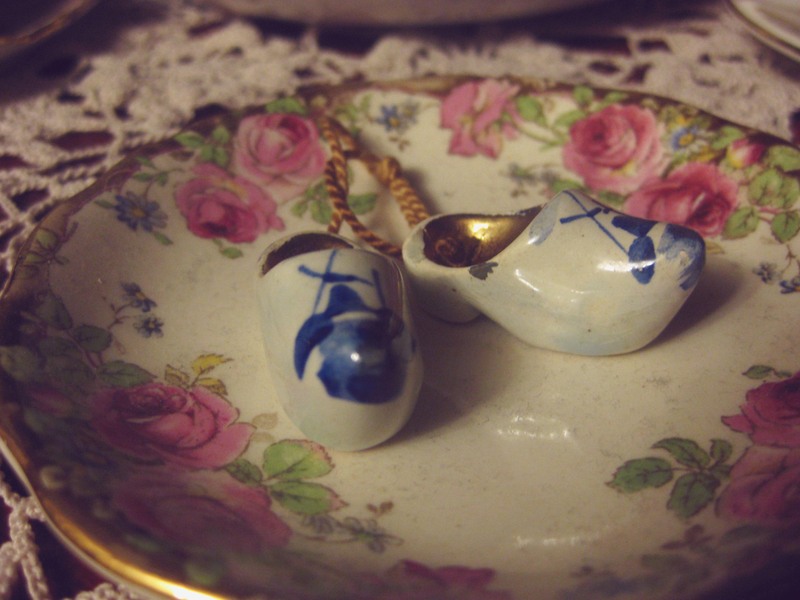 These things came out of my pen.